As a child I always dreamed of making it to this mysterious city that was created on water where the main mode of transportation is water. How can it be? My grandparents had gone when I was younger and have pictures hanging in their house. I would always gaze at them and dream about visiting. Who knew that it would actually happen! After I got back from the states with my heart still raw with pain, I just wanted to get away. Preferably I wanted to go to the beach and relax, but in early April all of the European beaches are still iffy on the sun level. 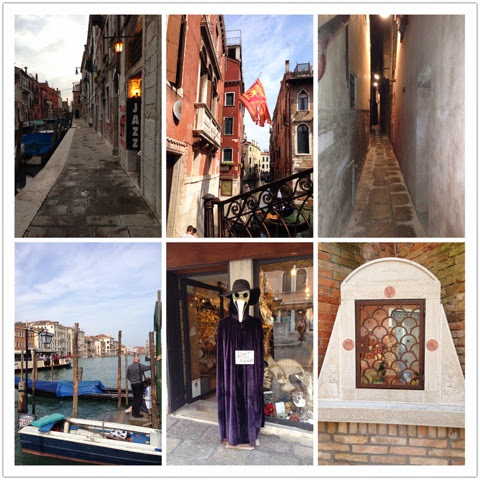 We pondered for a while and came up with Venice as a nice relaxing city to explore. And that it was. This city wasn't jammed packed with sights to see and was completely a way to get away and relax. I'll always remember Venice for its peacefulness. I'm happy to report that I have a lot of pictures to hang around our home one day. **How we got there** This was our first Ryanair flight. 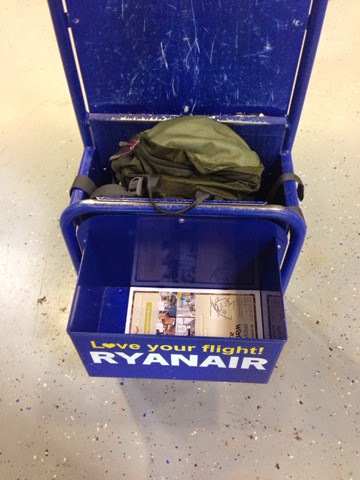 It was a complete success for our trip to Venice, and we are now on the Ryanair bandwagon. Normally we fly out of Frankfurt international airport. This includes somewhat of a trek for us: First we walk 15 minutes to the bahnhof (usually at a fast walk - run pace because we're late), then we take a 45 minute train ride to a bustling airport with packed security lines (we could drive but parking is pretty expensive at this airport, and a train ride from Wiesbaden costs around 4 Euro each way). Ryanair airlines is a 45 minute drive away, and has cheap parking (€7 a day), and wasn't a bustling airport at all. It made for a much more relaxing experience the day of our trip. The Ryanair flight to Venice lands 45 minutes away from Venice, and a shuttle bus (with A/C) for €18 round trip takes you directly there. We bought our tickets for the bus on the flight. This was so easy because they accepted a credit card. We were a bit skeptical when no one else was buying the bus tickets on the flight, but when we got off we noticed everyone standing around ticket kiosks for the same price. Oh, and flying with Ryanair means you have to pack light, but this is the whole reason we gifted ourselves backpacks before our European adventure. Yay, it fits! Plus, now Ryanair lets you carry a small personal item like a large purse! 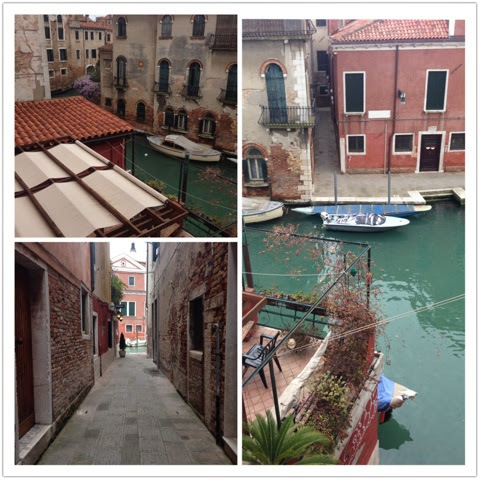 **Where to stay** If you've attempted to plan a vacation to Venice, you know that the hotels are ridiculously priced. We planned this trip two weeks before, and were left with either really pricey hotels or not so nice hotels. With little options left, we decided to go with a hotel that had a shared bathroom. I know, gross, right? Well, the hotel had amazing reviews, and Sam and I are minimalists, so we though what the heck we can save an extra €75 we might as well. Plus this hotel only charged a €1 Venice tax (per person per night) while others were charging €12. We decided if any trip this would be the one to go cheap on a hotels, since the city is so expensive. We stayed at Hotel Dalla Mora, and it was a fantastic experience. It was also the only hotel I could find with a canal view, and so worth it! We never came close to seeing the other couple that shared the bathroom down the hall, and it was always spotless. This hotel was also a five minute walk from where the Ryanair bus dropped us off, and not located on the touristy side of town. We probably walked 20 minutes to St. Mark's Square from here, but we took all of the travel guide books suggestions and got "lost in Venice". Also, if you book in advance they have rooms with bathrooms for only €110! Our hotel and canal view! Our first day out we just wandered a bit and found ourselves on the Grand Canal staring at the Rialto Bridge with our mouths open in awe. **Tip** This was our first trip using the TripAdvisor City Guides App. It allows you to predownload the city you are visiting and have tons of information at your fingertips while not using data/WiFi. Download it now and check it out. You can also create an itinerary of your trip by checking in at locations you visit, so you can share it with friends that visit the city later. Such a great idea! Just a few pictures from around town. Top left to right: 1. Venice Jazz Club canal 2. Venitian flag with the lion of St. Mark. Bottom left to right: 4. Canal 5. 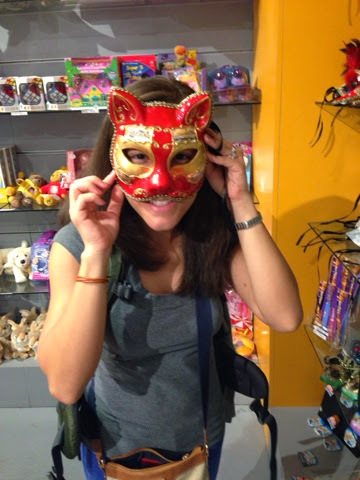 Venice is a huge destination for Carnival, so there are elaborately decorated masks everywhere. 6. Mary statue located in a small corner along a canal. 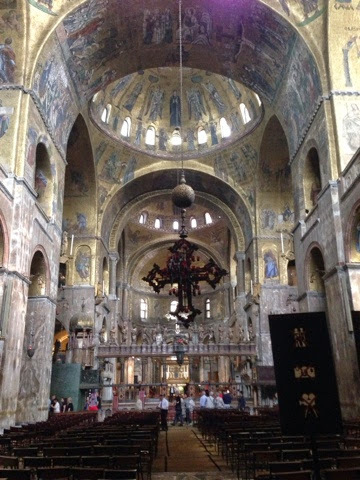 St Mark's Cathedral is gorgeous and has a mixture of architecture. Rick Steve's says it best, "You'll see Roman style arches over the doors, Greek style columns alongside, Byzantine style mosaics, French Gothic pinnacles on the roofline, and topping the church the onion-shaped domes that hint at the Islamic world. All these plundered elements are only appropriate for a church built on the bones of a stolen saint". Amazing, right? St. Mark's remains were stolen/rescued from Alexandria, Egypt in 828, seven centuries after his death. They cleverly hid his remains in a pork barrel and brought him to Venice! I'm sad that they were restoring the outside during our visit. 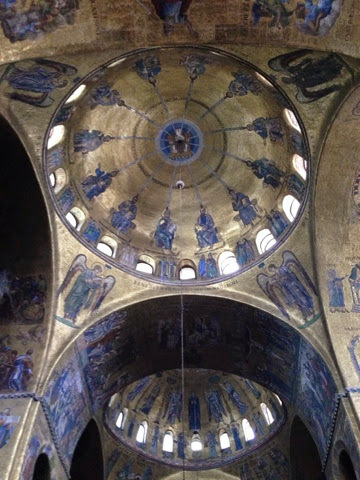 The golden Byzantine style mosaics inside were gorgeous! 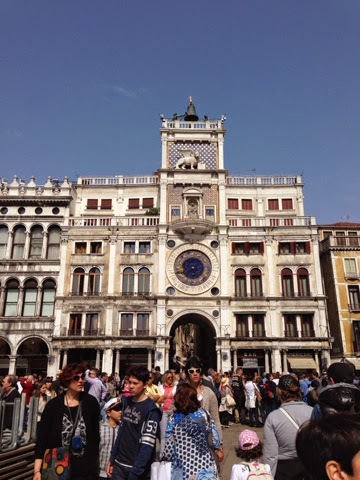 Saint Mark's square is the famous square where tons of movies have been filmed: The Italian Job, Casino Royale, and Just Married to name a few. I can't imagine how much it must have cost to get them to allow tiny mini coopers running all over this square! 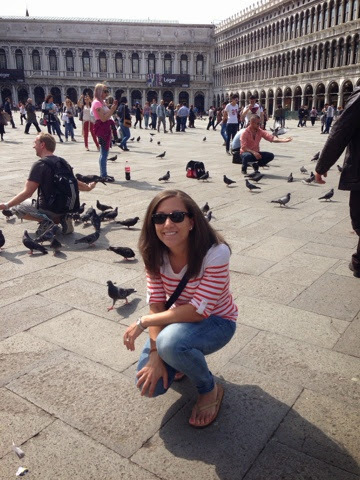 Sometimes between autumn and spring, the tide peaks in the Adriatic sea and St. Mark's square is covered in water. My very own Casanova courtesy of a lost sunscreen bottle. Next door is Dodge's (Duke) Palace (where the Venetian ruler stayed). This was the most popular half acre in all of Europe from 1150 - 1550. People couldn't believe how the Venetians could live without a king, bishop, or tyrant. Notice it's unlike any other medieval city in Germany with a castle or wall surrounding the city. Dodge's Palace - "The Wedding Cake, " or "The Pink House"
One of our favorite things we did was people watch in St. Mark's square. 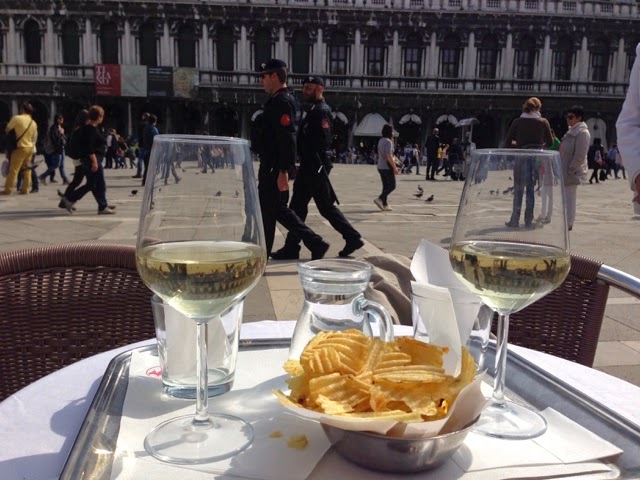 Make sure you drink a few glasses of wine at a cafe and take in the sights. I told Sam that the Bridge of Sighs was named that because so many people thought it was gorgeous and just sighed when they saw it. Not true. In reality it is the last bridge that convicts in Venice saw before their imprisonment. Prisoners would sigh at their last view of the beautiful city. It is one of the most photographed bridges in the world though. Look at it, you're sighing right now, aren't you? Legend has it that kissing at sunset on a gondola ride while passing under the bridge with the bells from St. Mark's Campanile ringing is supposed to grant eternal love and bliss. If all of that aligns, then it has to be true! We ate way too much food! Carb after carb after carb entered our bellies. 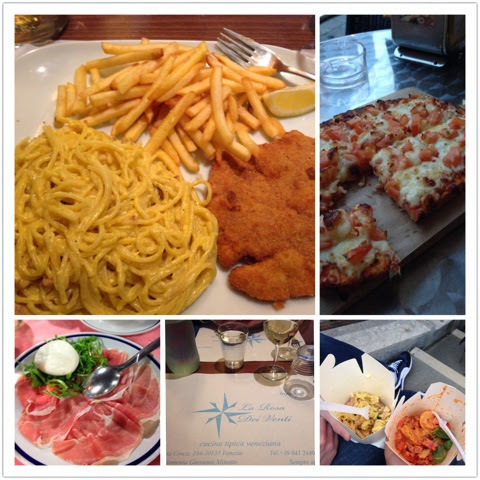 We generally tried to eat more toward our hotel because it seemed like more locals were eating in the area, and everything around St. Mark's square seemed too touristy. Except at Alfredo's Fresh Pasta To Go (#2 restaurant on TripAdvisor!). It was so good and a great price. It isn't a sit down restaurant, but we enjoyed sitting on a bridge nearby and watching the gondolas ride by while devouring our pasta. I enjoyed tasting authentic lasagna for the first time. We noticed that the lasagna had less marinara sauce, and lots of cheese...yum! The seafood pasta was also a must. It was delicious! Can we go back? I need more pasta, cheese, and wine! TripAdvisor says that the Venice Jazz Club is a must see, and we wanted to try something different, so we reserved a table and were not disappointed. Well, the food is disappointing but even the staff tells you that they are not a restaurant over and over. Take some extra time and eat at a cafe in the cool and trendy area nearby. The same night we visited the club, a musician named Pete Cornell was visiting Venice and asked if he could play with the band that night. He plays the tenor-saxaphone. Coincidence? I think not. I closed my eyes and knew Trevor was playing for me that night. 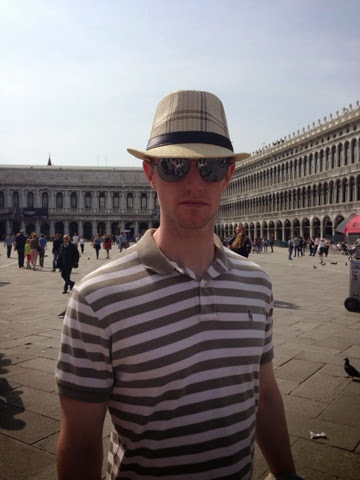 I was on a mission to take all modes of water transportation while in Venice. A vaparetto is like a water bus on the Grand Canal. 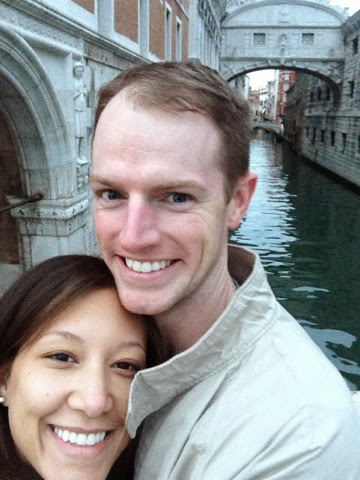 We took this all the way from the train station to Saint Mark's square. It took about 45 mins, and we listened to Rick Steve's audio tour of important sights along the way (If you don't have the Rick Steve's audio Europe App, Download it ASAP. You never have to lug the books with you again!). Next we took a traghetto ride. 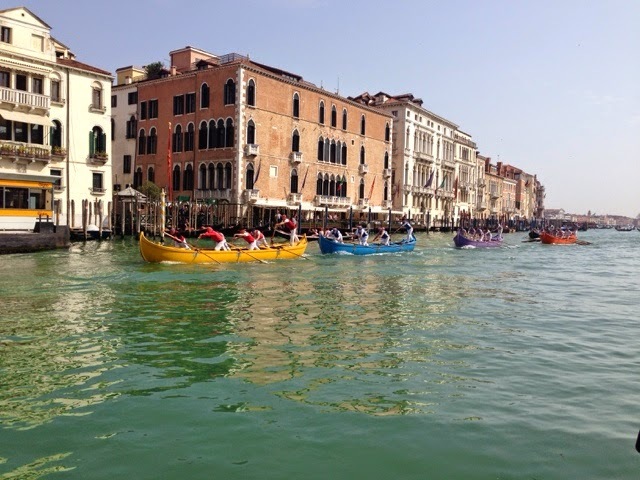 This is a gondola that you stand in and cross the Grand Canal. Mostly locals use it, so they don't have to walk all the way to Rialto Bridge to cross. This was difficult to find, and less exciting to be honest. But we had a fun adventure finding it. Last but certainly not least was the gondola ride. Every girl's dream! It was pricey but so worth it! It felt like we were gliding on the water, and it was so peaceful. We tried to get as close to the cutoff time when prices go up for sunset as we could, and we also did the ride closer to our hotel. 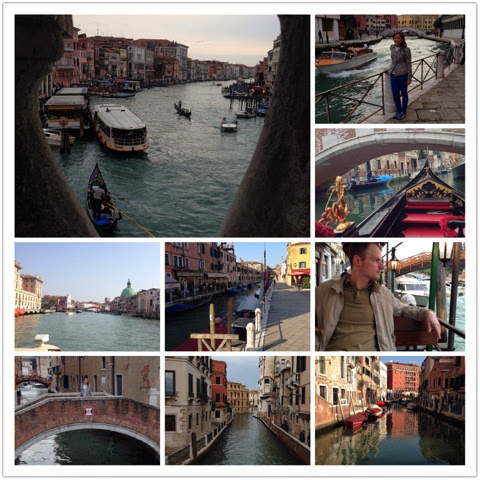 We noticed during the day around the tourist attractions that there would be a gondola train. That's not romantic at all. My favorite is the gondolier on his cell phone. Hahaha! We passed our hotel on the gondola ride! 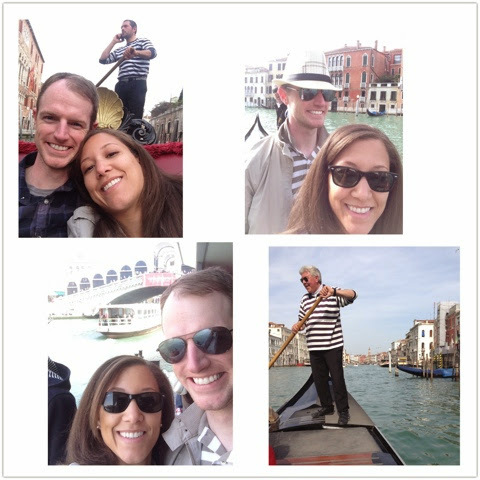 Smooch, because how many times in your life are you on a gondola in Venice? 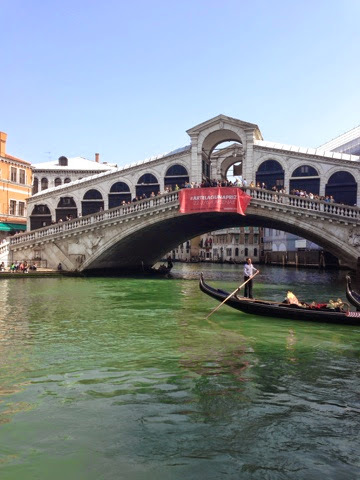 Take a ride with us on the vaparetto and hear an opera singer singing for gondola riders. These tourists knew what they were doing. They had three gondolas and one opera singer. An opera singer costs around €50 on top of your €80 gondola ride (that's before sunset, prices go up after), so why not share it between your friends! Here is a clip at the Venice Jazz Club. Close your eyes like I did and enjoy the music. Omg those canal pictures are GORGEOUS! I want to go there! 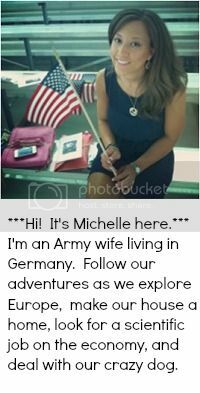 You are going to have THE BEST photos for your house after being stationed in Europe. And the food! Omg. Jealous once again!